Higher Nature Colloidal silver contains pure, medical grade silver, which has been used for many centuries for antimicrobial cleaning. It is produced using electro-controlled technology and pure water from a 9-stage water purification process, to achieve a very small particle size (0.0006 to 0.005 microns). This small particle size is important because it provides a much greater surface area and therefore more of an effective liquid for cleaning your home. Use the 200 ml non-spray nozzle to refill the 15ml and 100ml spray-nozzle sizes. Also available in 100ml and 200ml. Contents: Purified water and 99.999% pure silver, at a concentration of 10 ppm (parts per million). Spray all around the home. For external use - do not consume. Use the 200ml non-spray size to refill the 15ml and 100ml spray-nozzle sizes. Can be sprayed into the air. 36 sprays are roughly equivalent to 1 teaspoon. Below are reviews of Colloidal Silver - High Stability - 15ml by bodykind customers. If you have tried this product we'd love to hear what you think so please leave a review. Excellent all round product. I use it particularly for blocked ear/infection - it is the only remedy that works ! Wonderful product, can be used for sore throats, infections, cuts, actually just about everything!! Excellent product, use to spray into mouth and ears if feel like cold or sore throat coming on. Can use to spray on cuts, wounds, etc. Great all Rounder Helps to heal burns, kills MRSA and at this time of year a regular spray in the mouth to avoid the many colds and bugs doing the rounds. Question about Colloidal Silver - High Stability - 200ml Could you please tell me if your Collidal Silver is in a glass bottle? Yes, all our colloidal silver products are supplied in glass bottles. Question about Colloidal Silver - High Stability - 200ml How many ppm is your collodial silver? All our colloidal silver products contain 10-12 ppm (parts per million). 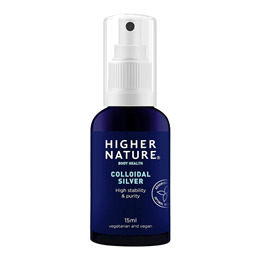 Question about Colloidal Silver - High Stability - 100ml Is the colloidal silver spray used to treat chest infections - do you use it as a preventative or after infection starts? Colloidal Silver can be used as both a preventative and cure, however, it is generally used to treat an existing infection or virus. Using the spray you are able to treat infections of many kinds, but lends itself very well to chest and throat infections. Question about Colloidal Silver - High Stability - 100ml Could you please tell me if your Collidal Silver is in a glass bottle? Question about Colloidal Silver - High Stability - 100ml How many ppm is your collodial silver? Question about Colloidal Silver - High Stability - 15ml Could you please tell me if your Collidal Silver is in a glass bottle? 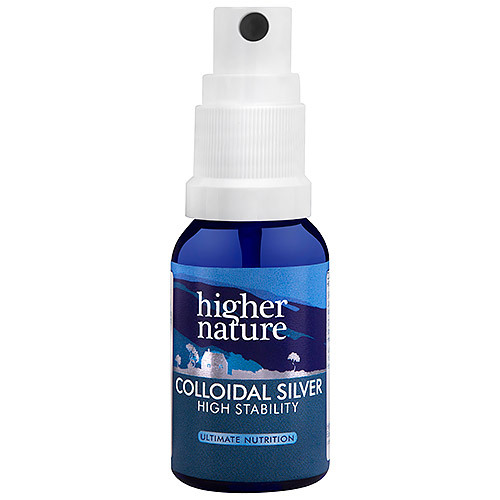 Question about Colloidal Silver - High Stability - 15ml How many ppm is your collodial silver? Higher Nature Active Silver contains Silver, which is known to have antiseptic and antimicrobial properties. Made using electro-controlled technology and very pure water.